A beautiful bunny rabbit personalised baby grow. 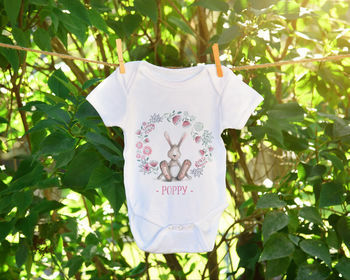 This gorgeous, personalised babygrow makes a great birthday gift or even for a baby shower. The design features a beautiful hand drawn bunny rabbit and flowers. The baby grow is personalised with the name of your choice. Available in 4 sizes - 0-3 months, 3-9 months, 9-16 months and 16-24 months. Soft cotton fabric with a polyester topweave.